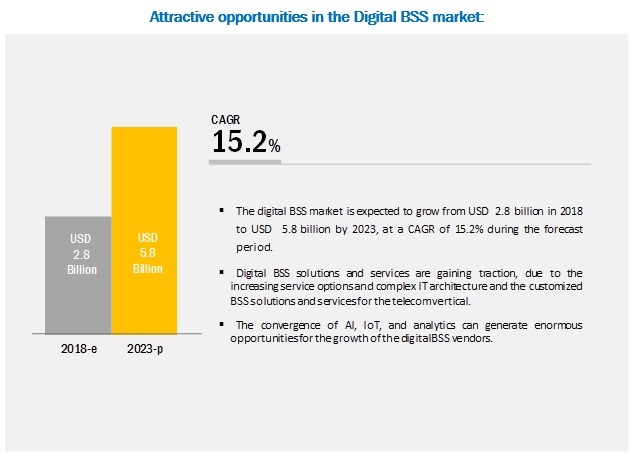 [147 Pages] The global Digital BSS Market size is expected to grow from USD 2.8 billion in 2018 to USD 5.8 billion by 2023, at a Compound Annual Growth Rate (CAGR) of 15.2% during the forecast period. The study involved 4 major steps to estimate the current market size for the digital business support system (BSS) market. The exhaustive secondary research was done to collect information on the market, the peer market, and the parent market. The next step was to validate these findings, assumptions, and sizing with industry experts across value chain through primary research. Both top-down and bottom-up approaches were employed to estimate the complete market size. Thereafter, market breakdown and data triangulation were used to estimate the market size of segments and sub segments. In the secondary research process, various secondary sources, such as Hoovers, Bloomberg BusinessWeek, and Dun & Bradstreet, have been referred for, to identify and collect information for this study. These secondary sources included annual reports, press releases and investor presentations of companies; white papers, technology journals and certified publications; and articles from recognized authors, directories, and databases. The key players in the industry and markets have been identified through the extensive secondary research. 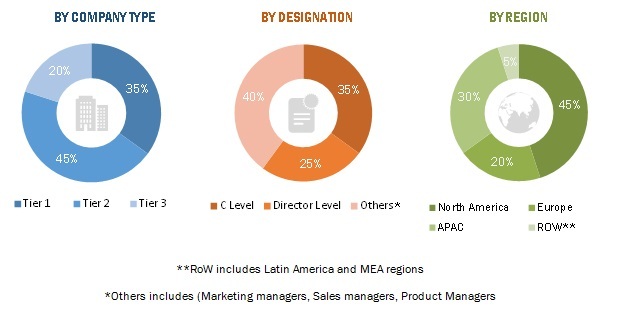 The digital BSS market expenditures across regions, along with the geographic split in various segments have been considered to arrive at the overall market size. After arriving at the overall market size using the market size estimation processes as explained above the market was split into several segments and sub segments. To complete the overall market engineering process and arrive at the exact statistics of each market segment and sub segment, data triangulation and market breakdown procedures were employed, wherever applicable. The data was triangulated by studying various factors and trends from both, the demand and supply sides, in the digital BSS industry. 1 Micromarkets are defined as further segments and subsegments of the global DIGITAL BSSmarket included in the report. 2 Core competencies of the companies have been captured in terms of their key developments and key strategies adopted by them to sustain their positions in the market. Ericsson (Sweden), Amdocs (US), CSG International (US), and Hansen (Australia). A total of 25 players covered. This research report categorizes the Digital BSS Market based on component [solutions (revenue and billing, customer, order, and product management), services (implementation, consulting, license and maintenance, training and education, and managed services)], application (SMEs and large enterprises), deployment model (public, private, and hybrid cloud), and region. The global Digital BSS Market size is expected to grow from USD 2.8 billion in 2018 to USD 5.8 billion by 2023, at a Compound Annual Growth Rate (CAGR) of 15.2% during the forecast period. The advent of tailored BSS solutions and new commercial models, reduced operational costs, and the increasing online transactions and the use of multiple mobile devices are the major factors driving the growth of the digital BSS market. Across the globe, the telecom vertical is growing at a remarkable rate. This impressive growth of the vertical could be attributed to the increasing number of subscribers across the world, which has emerged due to the rapid global economic and demographic changes. However, this rise in the subscriber base has resulted in different challenges and issues for the telecom companies. Digital BSS solutions and services offer complete support to the telecom operators in their routine business activities and operations. 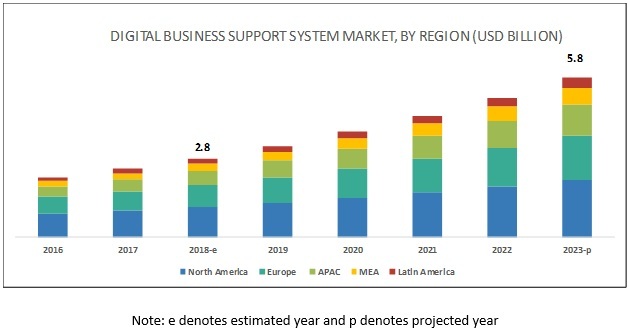 The Digital Business Support System Market by solution has been further segmented into revenue and billing management, customer management, order management, product management, and others (inventory and number management, policy management, and back office process management). Out of these solutions, the customer management segment is expected to grow at the highest CAGR during the forecast period. Managed services play a vital role in customer satisfaction. The reason being, with the increasing number of products and clientele, it becomes difficult for the vendors to focus on core business processes and support other multiple functions as well. As a result, managed services have become a high-growth segment in the industry. These services offer technical experts to assist customers’ in maintaining and updating all the software in the cloud systems management software ecosystem. All the pre- and post-implementation queries and needs of customers are also addressed under managed services. Managed services offer the end-users with software configured to their requirements to offer assistance at every step of the software’s usage. Managed services include the deployment of customers’ server, networks, software, remote support, and inventory tracking. The North American region comprises well-established countries, such as the US and Canada. These countries have invested significantly in R&D activities, thereby contributing to the development of new technologies. The US and Canada are also the early adopters of trending technologies, such as IoT, big data, DevOps, and mobility, and this reason creates enormous opportunities for the growth of the Digital BSS Market. The startup culture in North America is growing at a faster pace as compared to the other regions. The advent of SMEs and the increasing digitization trend in the telecom industry have also aided in the growth of the North American digital BSS market. Major vendors in the Digital BSS Market are Amdocs (US), Huawei (China), Ericsson (Sweden), NetCracker (UD), CSG International (US), Nokia (Finland), IBM (US), Capgemini (France), ZTE Corporation (China), Optiva (Canada), Openet (UK), Sigma Systems (Canada), Cerillion (UK), Sterlite Tech (India), Accenture (Ireland), Comarch (Poland), Infosys (India), Oracle (US), Mahindra Comviva (India), Qvantel (Finland), BearingPoint (Finland), FTS (Israel), MATRIXX Software (US), MIND CTI (Israel), and TCS (India). In September 2018, Telefónica Deutschland selected Netcracker’s cloud BSS Solution for digital transformation. This initiative will enable the telecommunications provider to evolve its digital customer and business enablement layers, incorporating the latest digital technologies to optimize core processes and deliver a more holistic and personalized digital experience for businesses and residential customers. In November 2017, Ericsson completed the live deployment of BSS with MTN Cote D’Ivoire. The deployment included Ericsson Charging System, Ericsson Dynamic Activation, and Ericsson Multi Mediation. The system modernization process included the replacement of legacy BSS platforms. In November 2015, CSG International announced that Satec would deploy CSG’s award-winning Revenue Management solutions at Angola Telecom. The integrated solution will include CSG Singleview Convergent Rating & Billing, Singleview Customer Management, and Intermediate, as well as, the expansion of CSG Interconnect to include CSG Route and Financial Manager. Where would all these developments take the industry in the mid to long term? What are the upcoming industry solutions for the Digital BSS Market? Which are the major factors expected to drive the digital BSS market in the near future? Which region would offer a higher growth for the vendors in the digital BSS market? Which solution would see the largest market share in the digital BSS market?